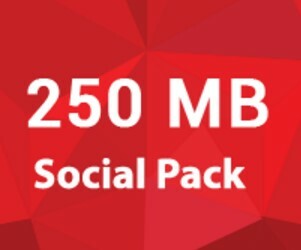 Welcome to Robi Social Pack 250 MB 10 TK with 28 Days Validity. All the Robi connection users are eligible to enjoy Robi 250 MB Social Internet Pack 10 Taka Offer. If you are a Robi customers and searching one month Validity Robi Social Pack in cheap rate, We recommend you first check the Robi Social Internet Pack 250 MB 10 TK Offer with 28 Days Validity detail information. To activate Robi 250 MB Facebook, Whatsapp Messenger, Circle App, Facebook Messenger Internet @ 10 TK Offer, Customer needs to Dial USSD code *8444*0250#. The validity of Robi Social Pack 250 MB Internet 10 TK Offer 28 days. Customers use the Robi 250 MB 1month Validity Social Internet Package both 2G/3G area networks and uses times 24 hours. To check the remaining balance of Robi 250 MB Internet 10 TK Offer 2017, just Dial USSD code *8444*88#.